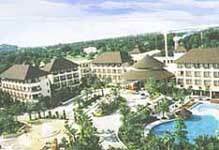 The Tide Resort, a first class accommodation on Bangsaen beach on the Gulf of Thailand. Located about 95 km to the south east of Bangkok, the resort offers families, individuals, groups as well as business people perfect holidays and retreats just one hour away from the capital. Nearby tourist attractions include Khao sammuk view point, Marine aquarium, Nong Mon day market, Ang Sila Stone product village, Buffalo flighting field, Golf courses, Snake farm, Tiger zoo, Nong Nooch garden, Tropical Botanical gargen, International Pattaya circuit (car racing), Si Racha deep sea port, Million years stone park (Pattaya). 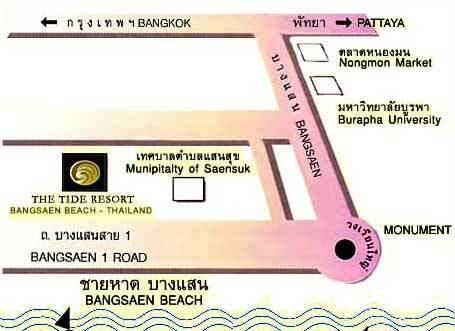 44/1 Bangsaen Beach 1 road, Tambon Saensuk, Ampur Mueng, Chonburi 20130. Phone: 038-399 222; Fax: 038-399 200.